The arrest was made after a complaint was filed against him by the AMC's security officer. A video clip purportedly showing Rashid being assaulted by BJP corporators went viral on social media. An AIMIM corporator has been arrested in Aurangabad on charges of trying to promote enmity and incite riot after he opposed a resolution in the municipal corporation to pay tributes to former prime minister Atal Bihari Vajpayee, police said today. 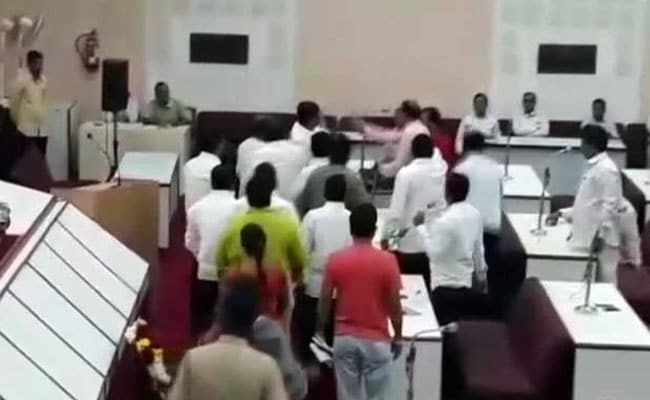 The police later also registered a case against five BJP corporators including the deputy mayor of the city for allegedly thrashing the AIMIM corporator at the meeting of the civic body in Aurangabad in central Maharashtra. Syed Mateen Sayyad Rashid, a member of the Aurangabad Municipal Corporation (AMC) belonging to the All India Majlis-e-Ittehadul Muslimeen (AIMIM), was arrested last night, a police official said. The arrest was made after a complaint was filed against him by the AMC's security officer, he said. Syed Rashid, 32, was booked under IPC sections 153-A (promoting enmity between different groups), 153 (want only giving provocation with intent to cause riot) and 294 (obscene acts in public) at the City Chowk police station. Earlier yesterday, Syed Rashid was allegedly thrashed by BJP corporators for opposing a condolence motion for paying homage to Atal Bihari Vajpayee who died in New Delhi on August 16. The alleged incident took place during the general body meeting of the civic body, ruled by BJP-Shiv Sena combine. After the meeting began, Bharatiya Janata Party (BJP) corporator Raju Vaidya tabled a proposal to pay tributes to former PM Vajpayee. Syed Rashid opposed it, which infuriated the saffron party members who allegedly thrashed him, the police official said. A video clip purportedly showing Corporator Rashid being kicked, punched and slapped by BJP corporators went viral on social media and was also aired by some TV channels. The general body of the AMC later passed a resolution to cancel Corporator Rashid's membership, a civic official said. Soon after the fracas at the meeting, Deputy Mayor Vijay Sainath Autade directed the AMC's security officer to lodge a complaint against the AIMIM corporator for attempting to create enmity between two communities, he said. Syed Rashid was admitted to the Government Medical College and Hospital for treatment of injuries he suffered in the attack. He would be questioned after he is discharged, said inspector Dadasaheb Shingare of City Chowk police station. The AIMIM corporator had told PTI last night that he was opposing the move to pay homage to former PM Vajpayee in a "democratic manner", but was assaulted by around a dozen BJP corporators. Cases of assault were also registered today against five BJP corporators on a complaint lodged by Corporator Rashid. None of them has been arrested yet, police said. Offences under IPC sections 323 (voluntarily causing hurt), 506 (criminal intimidation) and 147 (rioting) were registered against deputy mayor Autade and four other BJP corporators including a woman, said inspector Shingare. Police were also looking for around a dozen persons who vandalised a car and created ruckus outside the AMC building, he said.